Using unusual tobaccos from countries not known for their tobacco production is a good way to appeal to the novelty-driven cigar smoker. Use fire-cured pipe tobacco in a cigar? Sure, I’ll try it. I might hate it — and I did hate it — but I had to try it. CAO’s Colombia blend relies on a similar device. They claim on the Cigar World website that the CAO Colombia is the “first cigar to prominently feature Colombian tobacco.” Well, it isn’t. 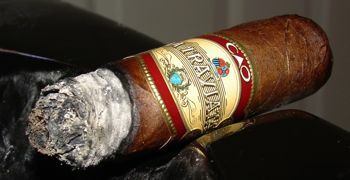 Not only is it not the first cigar to prominently feature Colombian tobacco, but it isn’t even CAO’s first Colombian. Only a few years ago, the CAO Escaparate Colombia was made for Serious Cigars, though admittedly in limited numbers for a limited time. 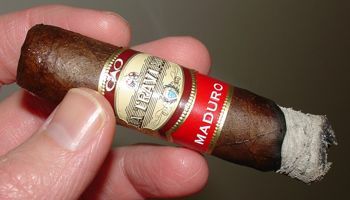 The Escaparate was a Colombian puro, as was the Colombian Gold made by Bravo Cigars that I reviewed many years ago. I loved the Colombian Gold and I’m happy to see a major cigar producer using Colombian tobacco, however it gets to market. 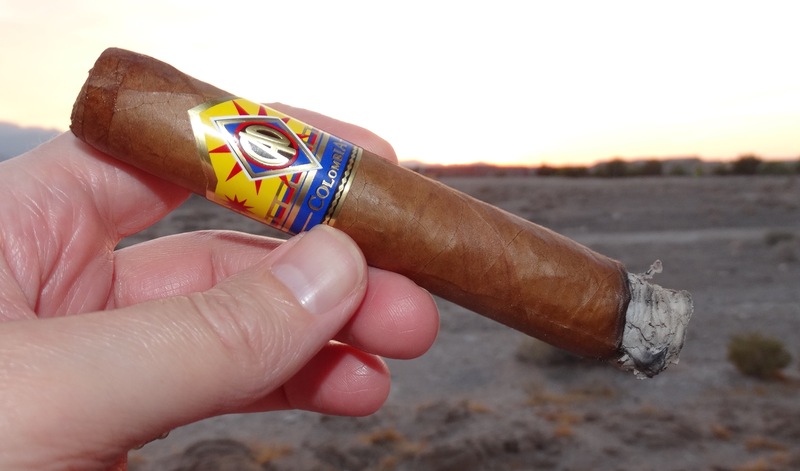 CAO’s Colombia is not a puro like the Escaparate Colombia — not even close, actually. To get to the Colombian we first have to visit the Jamastran valley of Honduras, where the wrapper originates, take a side trip to Cameroon for the binder, swim the Atlantic to Brazil for some Mata Fina long filler, and then finally we arrive the tiny village of Masinga in the Magdalena Department of Colombia. Here is where the ICA Mazinga comes from. I was a little concerned about this “Ica Mazinga.” Slide the a in “Ica” over to the next word and it’s “IC Amazing”. Uh, yeah. So I had to dig around a bit. ICA turns out to be the acronym for the Instituto Colombiano Agropecuario, the Colombian Agricultural Institute. It seems they are the the ones who developed this variety of black tobacco. ICA-Masinga, an improvement on the Cuban Prieto, produces thin leaves with an abundance of fine veins, good color, texture and aroma; the plant has an average height of 2.20 meters, 40 leaves, and a growth cycle of 150 to 160 days. The Cubita variety has been cultivated on the Atlantic coast since 1870 using varieties brought from Cuba with the initial goal of catering to the German cigar market. At first it was cultivated in the Departments of Sucre … and later expanded to Magdalena. The principal varieties cultivated have been ICA-Masinga, Cubita 12, Peraltero. Today they are exported to Germany for the production of cigars, and to France, Spain, Algeria, Tunisia, and Morocco for the production of cigarettes. Suffice it to say that ICA Masinga (or Mazinga) is a real thing. The CAO Colombia Tinto (robusto) is an attractive cigar with a glossy wrapper the shade of milk chocolate. There are some fine veins, but nothing to detract from this robusto’s uniform appearance. The roll is solid, the draw is easy, and it burns beautifully. As the curtain rises the Colombia Tinto goes into a soft-shoe routine that won’t offend anyone: mild notes of cedar overlay a grassy foundation. My first thought is that this is going to make a nice morning companion to my coffee on the patio. 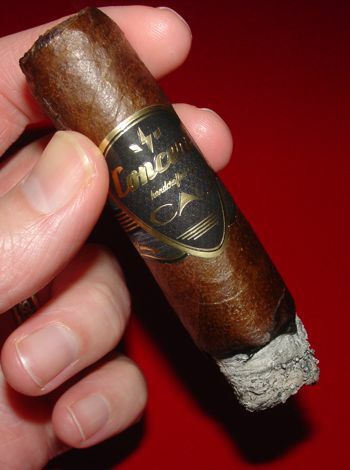 After a few puffs I’m impressed by the viscosity of the smoke: by the mid-point of the cigar I’d even call it buttery. The flavor of this robusto does not undergo a dramatic metamorphosis in its journey to nubdom, but there is a gradual transition across the spectrum of sweetness. The herbal base flavor becomes a little earthier, almost musky, while another dimension of spice is added to the aroma: it’s a sweet woody aroma less sharp than cedar, almost like sandalwood joined by a touch of caramel. If olfactory memory serves, the CAO Colombia is a lot like Bravo’s now-extinct Colombian Gold. Like that cigar, CAO’s blend is a mild but earthy Cuban-style smoke with great aroma and a nice body. This is a medium-to-full bodied blend but it is mild in strength and flavor. A great breakfast smoke and a perfect choice for the mild cigar enthusiast. To cap it off, the price is surprisingly affordable: $4 to 5 USD per stick (box price). 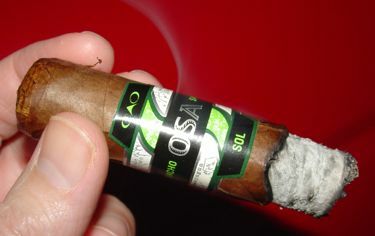 But the brand continues to evolve, and the latest creation to crawl from the surf is this one, the OSA Sol. The San Agustin valley is not on any map I can find, but if the coordinates that are printed on the OSA band are correct, it’s just across the El Paraiso border. Hopefully that makes it easier to leave. I looked at the coordinates on Google Maps and it appears to be an extremely remote location. No surprises there. 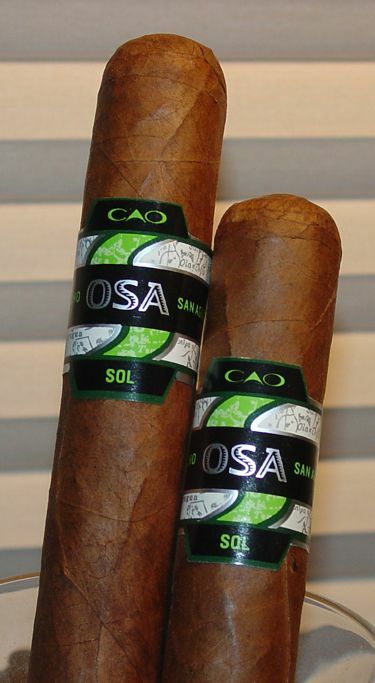 The star of the OSA Sol is the wrapper, but you wouldn’t know it by looking. It’s a little rough, fairly veiny, and somewhat dry in appearance. The cap is smooth but sort of pasted over a round Cullman style head, emphasizing its functionality. The cap cuts neatly though, and it doesn’t unravel. Triple seams are nice to look at, but function is what counts. The roll of the cigar is solid, but contrary to some other reviews I found these to draw a little too freely. They seem to burn pretty quickly, which may be a result of the loose draw. On the other hand, the burn is perfectly even, and the ash is smooth and solid. Overall construction: good to very good. In a word, the OSA Sol is woodsy. Cedar and humus. It starts up with a cedary spice and a touch of tannin on the tongue. It’s smooth on the palate though, and the aroma is sweet and woody. A couple inches into the cigar and the wrapper really starts to shine. Nuanced notes of apple and leather combine with the cedar in balanced complexity. The smoke remains smooth up to the end, but a slight pucker of tannin persists; a dash of pepper in the last third adds a dimension to the woody flavors on the palate. The sweet woodsy aroma continues to the end, but the flavor starts to char at the band. Based on its wrapper I thought the OSA Sol would be similar to the Punch Gran Puro, but it’s mellower and maybe a bit more complex as well. It’s a great medium-bodied smoke for this time of year — I always like a woodsy cigar when the temperatures start to come down, and this one is smooth and burns beautifully. I wish it were a little more affordable, but 6 USD is probably not too much to ask. It’s worth a shot if you’re in the mood for a smooth and flavorful autumn smoke. Special thanks to General Cigar for providing samples of this new blend. 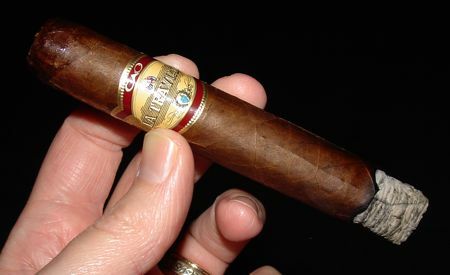 La Traviata is the Top 25 cigar that didn’t make the cut. So many people noticed that this cigar wasn’t on Cigar Aficionado’s “best of” roster for 2009 that it was thought to be an oversight. The objections were so widespread that CA issued an explanation: the new CAO blend was released too late in the year to be eligible for inclusion in their list. This is how you get attention by being overlooked. La Traviata is an old Cuban brand name and an even older Italian opera by Giuseppe Verdi. The opera tells the tragic tale of a consumptive courtesan (la traviata literally means a “strayed woman”) who falls in love, with somewhat predictable consequences. The first production of the opera was a failure in part because the woman playing the courtesan was hardly consumptive — she was in fact obese — and a close examination of the woman on an old box of Cuban La Traviata reveals a similar misconception. It would appear that the cigar and the opera share little aside from the name. The cigar features an oily Ecuadorian Habano leaf wrapped around a Cameroon binder and filler comprised of ligero from both Nicaragua and the Dominican Republic. The blend was released late last year in three parejo sizes, and two more have just been announced: a corona gorda and the first figurado for the line, a petite belicoso. For this review I smoked the robusto-sized Divino, with samples drawn from two different boxes. The wrappers on these sticks are thick and oily, though the texture seems to vary from smooth to quite grainy. The color is a very dark colorado maduro, or perhaps even straight maduro. Veins are prominent but not unsightly, and the head is a little irregular but solid. The cap is pasted on, not wound, but shears away nicely. The roll is rock solid to the touch but the draw is excellent. The ash is solid and the burn is even. 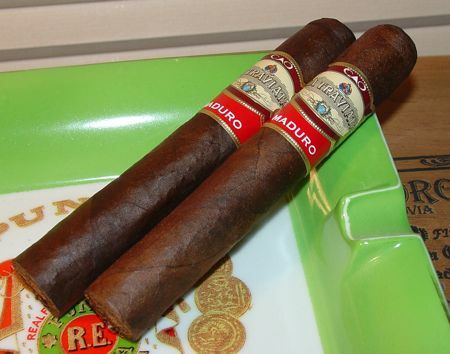 All this cigar lacks is the perfect Cuban-style triple cap. Other than that, there’s really nothing to complain about here. A hard woody flavor combined with a peppery overtone opens this cigar. The smoke is smooth, but a tad tannic on the palate. The sweet spicy aroma reminds me a little of hickory, similar to what I find in Illusione Original Document and other cigars that utilize Aganorsa Nicaraguan tobaccos. The flavor here is not quite as clean as that, but it’s bright and tasty. The tannins even out in the middle section but never disappear entirely. The foundation flavor remains woody, at times veering to leather. Light caramel-coffee flavors and notes of malt show up in the aroma. Up to this point I found little to substantiate the Cubanesque aspirations of La Traviata, but in the last third I did find a fleeting muskiness reminiscent of cuban cigars. It didn’t last long, but for those last few puffs about half an inch from the band I could have been fooled. Unfortunately the flavor becomes a little dirty after this point, somewhat carbonized and burnt tasting, but this is after a very eventful three quarters. Now I understand what the rumpus is all about. This is a dandy smoke. La Traviata is medium to full in body with a rich and complex woody flavor that finishes up with leather and a momentary glimpse of the forbidden isle. All of the cigars I’ve smoked from this line have had rock solid construction and burn beautifully. But wait! There’s more! 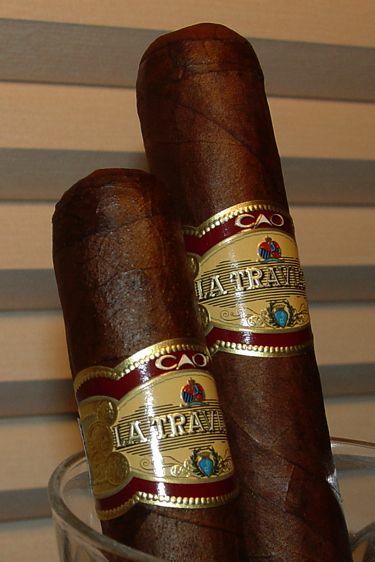 CAO has set the price point for La Traviata alluringly low, right around 5 USD per stick for the Divino. I can think of many cigars in the 10 dollar range that pale by comparison to this smoke. This could be the best buy of the year, and for what it’s worth, I think it’s the best blend CAO is making right now.